Just as Saints fans commenced rest and put good riddance on the inexplicably crappy football season that was 2014, an in house imbroglio rich in speculation and gossip broke to kick start the off season. The match-up is a lot juicer than upcoming free agency and the college player draft. Indeed, even if mostly fictionalized, the material could be the genesis for Airline Drive, and run on prime time television, like Dallas. The soap opera requisites of new wealth, its division and inherit strife, jealousy, and comprehensive human foible, with some incidental good heartedness along the way, are all there for a writer’s taking. God forbid though, this script end with Who Shot Mistah Tom? Heck, if the competitive glory of the pursuit of a Super Bowl were played out in a series against daily dramas equivalent to Vicodingate, Bountygate, and now Bensongate, Airline Drive could have a leg up on and give Dallas a long term run for its money, considering how summarily nuts this country has become about football as recreational viewing, and especially, big business. To the extent that it’s been easy for long term lovers of the game have acquired, with acceleration, a certain jadedness, cynicism, and boredom in watching much of it, in that all along we assumed it had included redeemable American fabric. In N’Awlins’ case, the attraction has been the perceived uniqueness of the beloved Saints, this mirroring the city, which has been a decent marriage, and one that has mostly superseded who the team owner happened to be (just 2). Some rah-rah coach was once quoted as saying football doesn’t create character, it reveals it. This is true, and the truth is, these days, we don’t like much of what we see. If the fabric wasn’t a mirage, it’s certainly been ripped into some pieces. Take for example, the start of the 2014 NFL season. The domestic violence mugshots that splashed across TV screens weren’t necessarily more guilty or frequent than those extant in the percentage of the general population, but they sure created the perfect storm in calling attention to a stereotypical portrait of the league as a depot for too many ill-raised, often fatherless kids who played their way there from the ghettos. And that’s on the stat sheet, not racial profiling. With a major assist from the NCAA, the institution that so ably and conveniently uses education as a shield for its considerable bottom line, the depths of which are unknown to most. At least the NFL generally makes no other insinuations about what protecting their shield means. And now, leading into the finality of this year’s Super Bowl, this week we were showered with stories about how many pounds psi may have been in a dozen balls for the home team’s advantage in the AFC Championship. And getting all the “investigation”, “cooperation”, and “credibility of the game” public relations jargon from the parties. Ironically, we heard the same media spins, as if rehearsed, for the much more disconcerting domestic violence issues last summer. Give Us A Break. Yet despite itself, and we need to remember the league didn’t invent the game as much as trademark it’s brand of it, sometimes the NFL does produce some fabulous football, such as the rollicking and wildly entertaining NFC Championship. Give Green Bay credit for showing up with their A Game in the most difficult environment in the league, and Seattle, well beaten for 55 minutes, to simply keep playing. Plenty of teams, down in that situation with that much on the line, have quit. In reprise, rarely have there been so many unique plays over 4 quarters that could have determined a different outcome. It was kind of sad the Packers didn’t get one last shot with the ball, regardless who one was pulling for. These types of contests are why plenty of fans keep watching, hoping to bump into one every now and then. Fighting over the lion’s share of a king’s ransom by blood kin and a subsequent spouse is hardly new. There can be compelling claims on both sides. Traditionally and ideally though, it should occur when the monarch is deceased; implicit in estate money grabs is that they should still have some semblance of common decency. Unfortunately, the original intents of the grantor do tend to get lost in the shuffle. Already in the legal proceedings, assets have been frozen by a judge in Texas, pending. Now, in Tom Benson’s case,You Can’t Take It With You has been supplanted by This Is Going To Be A Pain To Hold Onto. Interestingly from a legal perspective, we will ultimately find out how much irrevocable there really is in an Irrevocable Trust. Will it set any far reaching meaningful precedent? Knowing what he knows, or feels, now, we are sure Mr. Benson wishes he had set up a Revocable Trust instead. Since then the image of Benson has much improved. Fans remember, Pre Katrina, the days of State Of The Saints annual press conferences, when the owner grumbled about not enough tickets being sold (to watch perpetually mediocre teams, that part of the equation went unsaid), and the need for a new stadium for the club to compete in the new paradigm of the NFL. Of course, he was referring to profit and loss, while the fans cared about a contender. The ambiguity amongst the two has always been an absurd, misunderstood fact of life in NFL cities. A stab at New Orleans as bush league was made. And resented, insofar as the city’s by and large forever unyielding support of the Saints through countless competitively lean stretches since the late Sixties. Credit the population’s sense of humor in writing off all the miserable on field losses, and to keep coming back for more. 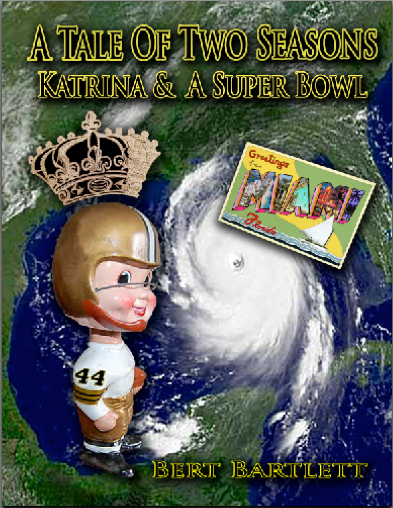 In the Crescent City’s darkest hour after the worst hurricane, the Saints sold out for the 2006 season. And have done so since. Post K, Benson has in fact been an exemplary hands off owner. With the exception of 2012, when he did not step in and put a stop to the circus interim arrangement and mandate a proven head coach like Jim Mora, Sr. or Marty Schottenheimer step in and handle the team for a designated year until Sean Payton’s return from suspension. The idea of staying within the building for the season was self-effacing garbage; Benson could have outlined it all quite properly from the get go, which would have included keeping staff and assistant coaches in place. This is a one year lease. Don’t change the car, just drive it. Left to his own whims, GM Mickey Loomis fumbled 2012 away, and since part of the suspension equation himself, should not have been left in position to make the decisions in the team’s best interests. Season ticket holders literally got ripped off, and predictably, the team dismally wasted a year. Team Gayle apparently has the support of GM Loomis, Coach Payton, and Drew Brees. Payton tried to insert an opt out in his contract that allowed him to leave if Loomis does, and the presumption was Loomis would have no desire to stay and answer to Team Rita, in the unlikely event she would now want him to anyway. If Team Rita got control, lots of lieutenants and sergeants in the front office perceived with certain stripes will be in for a change of employment. However the clash plays out, ironically, it is the NFL that could ultimately determine future ownership of the Saints, as the league has a three quarter owner approval rate in its bylaws. Forbes makes ongoing diligent estimations of the value of pro sports franchises. But whatever they are, it is much more what the market is willing to pay, given the scarcity of supply. If that Microsoft clown out in Los Angeles was willing to (over) pay $2 BB for the NBA’s scandalized Clippers, hardly a banner franchise, what are the Pelicans worth? Benson paid in the area of $330 MM for them a few years ago. And off that comparable sale basis, wouldn’t the NFL’s Saints be worth considerably more than a recent estimate in the $1 BB range? Why are reporters fessing up about the matter only now? Are only the public court filings giving them the green light to talk about it, i.e., did they stay silent out of fear of reprisal from wide reaching tentacles of the organization, starting at the top? Quite likely. Benson owns the local Fox TV affiliate. Freedom of the press exists in the city when it comes to the Saints, but lamely, candor of the press does not, given the blurry, long ago dissipated line between sports journalism and franchise promotion. The weave of the blanket is so smooth that the younger generation does not really recognize this, never having felt the difference. But that shortcoming is in all pro sports, certainly not limited to New Orleans. Now that the cats are out of the bag, it will get more unavoidably public. Dirty laundry will get aired. Team Rita’s personal lives and habits will inevitably come under unwelcome scrutiny, as will portraits of Team Gayle as a good old fashioned gold digger, a wolf in sheep’s clothing. Humiliatingly, Mr. Benson may be required to undergo a psychiatric evaluation challenging his soundness and state of mind, including an affirmation by him that the current President of the United States is not Ronald Reagan. Though they could afford it, privacy is a luxury item that’s not for sale at this point. That’s the opportunity cost in the fishbowl of owning pro sports teams. Some would say it’s still a small price to pay for owners to sit back and let the gobs of rising league revenue continue to roll in. As far as the Saints and Pelicans are concerned, Mr. Benson may never rest in peace. Posted in Pro Football, Uncategorized.